RBTH presents top 7 unsolved labyrinths in Russia. This labyrinth is located on Bolshoi Solovetsky Island. It is comprised of two interlaced serpents. Regardless of which way you walk, you will always return to the site of entrance. There is also a belief associated with this “Babylon”: a popular rumor says that the maze facilitates a doubling of wealth. For example, if you walk through the labyrinth with 10 rubles in your pocket, your capital will soon grow to 20 rubles. “Babylon” -- that is what the many labyrinths in the Russian north are called. One legend says that initially they were called “Avalon” (in honor of the Celtic mythical island of the blessed), and later, with the arrival of Christianity, “Babylon,” because the words sounded similar. It is believed that in ancient times, sacrifices were carried out in these structures and that the labyrinth itself is a place where people can travel to a different dimension. Built on the coast of the Kandalaksha Gulf three to five thousand years ago, it is unknown what initial function “Babylon” served. It is known that the Sami performed their shamanistic rituals there at the beginning of the last millennium. After that this place was populated by Russian pomors, who treated Babylon very cautiously. It was believed that a journey through the labyrinth could result in a descent into hell. In truth, they say, pomor-conservatives still use Babylon before beginning marine navigation: allegedly, with the help of the labyrinth it is possible to control the winds. Near the river Umba (near Kandalaksha) it is possible to find yet another “Babylon.” Most likely, its function did not differ from the neighboring Kandalaksha labyrinth. Local residents say that Babylon stands on an old Sami cemetery, and a trip through the maze could end in unwanted contact with ancient spirits. Ignatius Stelletskii, Russian archaeologist and researcher of “underground Moscow,” has much to tell about the mysterious structures that underlie many of Moscow’s buildings. According to him, underground structures beneath buildings from the sixteenth and seventeenth centuries, located within the Garden ring, are connected to the Kremlin by a network of underground labyrinths. The Italian architects of the Moscow Kremlin (Aristotle Fioravanti, Pietro Antonio Solari and Aleviz Novyi) created the initial plans for the underground capital. Archeologists have discovered a coherent system of 350 underground points, by which it is possible to get from the Kremlin to the Sparrow Hills. However after Stelletskii died, these findings became classified. The Urals accidentally discovered this maze under the Piskorski Mountains in 1915. During that time the Piskorski monastery stood on the mountains, which was the ancestral abode of the famous Stroganoff merchants. Under the monastery a system of tunnels was created, with underground chapels, secret cells, warehouses and other facilities. Exploring the labyrinth more carefully failed because soon the only underground pass into the labyrinth was sealed by a landslide. Interestingly, legends about hidden treasures in the mountains have circulated among locals for a long time. Peter I was a great fan of labyrinths. It is said that by order of the Tsar-modernizer more than ten structures were constructed throughout all of Russia. Peter is even credited with the creation of several of the “Babylon” structures on the White Sea, which archeologists allegedly have mistaken today for Neolithic structures. However, the authorship of only one labyrinth can be attributed to Peter Alexandrovich with full confidence -- one in Peterhof, which was constructed under the plan of French expert Jean Baptiste Leblond. The labyrinth, called “Garden Near the Pavilion Temple,” is a square area of about two hectares. In its center is an oval pool, from which eight tracks diverge; they cross the circular walkway and separate the land into sixteen sections, in which flowers are planted. 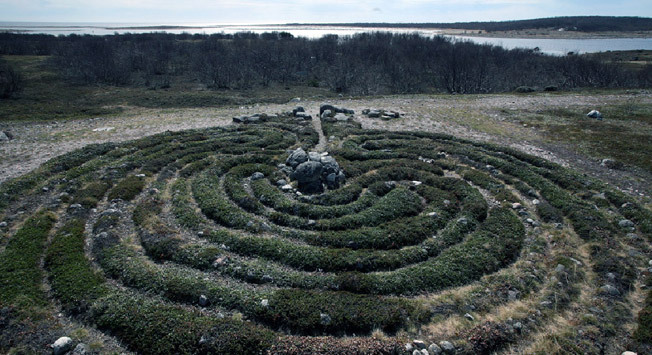 Despite its “herbal” origin, the labyrinth is not that innocent: it was rumored that some travelers disappeared there without a trace. According to another legend, the Russian Masons chose the “Garden Near the Pavilion Temple” as the site for their secret rituals. You can see this icon, written in the eighteenth century, in the New Jerusalem Monastery. Its image is very unexpected for Russian iconography: scientists speak of the influence of the western Christian tradition in the image. “Labyrinth Spiritual” includes twelve circles: two entrances lead into the Kingdom of Heaven, and twelve to hell. The icon serves as a sin detector: having gone visually from the center to the road, you supposedly will rest precisely in your major sins. People say that passing through “Labyrinth Spiritual” is possible only before confession.